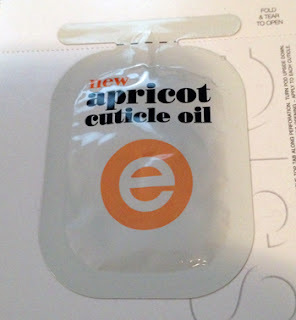 THE SKINNY: The first thing I noticed when I pulled open the Essie Apricot Cuticle Oil pagage was the aroma -- fresh and fruity and sweet. How could I not like this product? The oil went on to fingertips easily and did a great job softening and moisturizing my cuticles and hands in general. It looks like the full size comes in a nail polish bottle with a brush so my guess it that will be a little less messy. Because the package that I tore out of a magazine recently was messy. I got the oil everywhere. But it smelled so great I did not even really care. KEEP OR TOSS: Keep. Long-term use is really needed to test this fully. But the preview was nice. CHECK IT OUT: You can find Essie's cuticle oil at store such as Target and Ulta. Retail site reviewers seem to love it too!